Kelley and her husband, Cameron, are parents to two young, energetic boys and also own and operate Black Rock Lodge in Belize. As the owner of an eco lodge and frequent traveler, we knew Kelley would have a unique perspective to share. The story she tells inspires us to consider what esoteric experiences push our own family stories forward. Her essay is enchanting and insightful. We are overjoyed to share her voice with you. “Mommy, is that the Indonesian rainforest?” Our 4-year-old son was peering out of the airplane window at the lush, green landscape below as we prepared to touchdown after a five-hour flight. We travel a lot. That landscape below us could very well have been the Indonesian rainforest. Why not? Who’s to say this trip wasn’t to Papua New Guinea instead of Newark? My husband, Cam, and I both love to travel. In fact, our courtship was predicated on it. When we met, I was living in New York City and working on a project on Maui that required a monthly commute. And he was living and working in Mexico, traveling regularly back and forth to the U.S. Neither of us was afraid to get on a plane and there were a lot of frequent flyer miles accrued during our first few years together. Travel, whether it’s for business or pleasure, has always held a dual purpose for me. It can spur us to change our minds (lower case) in the moment – an immediate, disruptive influence. What follows is the possibility to change Our Minds over the long term – a subtle shift in a philosophical and moral trajectory. Of course, I haven’t always known this. It’s only now, forty one years into it that I’ve realized how I have allowed travel to alter and even disrupt my personal story. I tend to change my mind quite quickly for the unique chance to be curious and explore. And within this changing of my mind, I have also changed My Mind. Junior year of college, I borrowed some pantyhose from my dorm mate. 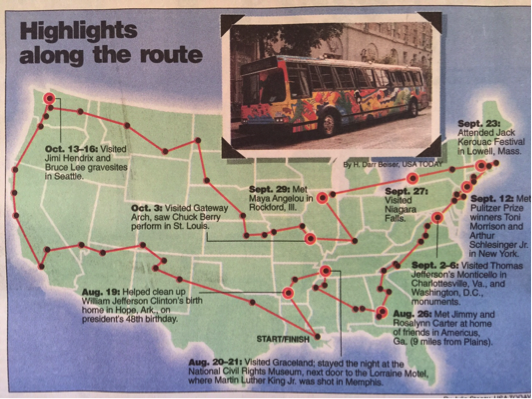 While in her room, I saw a flyer for “The Magic Bus,” a semester long bus trip across the U.S. with historian Douglas Brinkley. Within the hour, I had signed up and ditched my major in Art History. In my 30’s, I left behind my first career as an Interior Designer to pursue a Masters degree in Psychology. I soon scrapped those plans to join Cam, in Belize, at Black Rock Lodge, our rainforest eco-lodge, which we now own and operate. Flash forward to now, with two young boys. Cam and I continue to travel all over the place with our little family. We’ll take Belize, we’ll take New Jersey, heck - we’ll take anything. Sure, it’s exhausting to travel with kids. The logistics of setting up Pack & Plays, making sure we have enough “road snacks” on hand at all times, and figuring out how to entertain a rambunctious crew during a flight delay can be daunting. So, why do we do it? Well, the thrill of setting off on a journey and then taking in new places with our boys is amazing. We love the adrenaline rush in seeing their bodies and brains absorb the new and the different. The awe Cam and I both feel in seeing the world through their eyes and seeing Their Minds change is inspiring. Plus, travel is one of the most important ways our family story gets created – through curiosity and exposure. 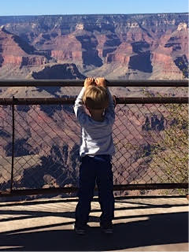 It started with Cam and me going from Maui to New York to Cancun and continues as we take our boys to the Grand Canyon, Belize, Sedona, New York City, and beyond. Through travel, we bump up against some of the 7 billion other stories (not to mention the innumerable ecological and cultural stories) on this planet. Through each bump we - as a family - shift, morph, absorb, and marvel at the world around us. Travel forces us to think and re-think. It changes Our Minds. Travel also helps our family to change its mind (lower case). Our family story is not static, linear, or rigid – my hope is that it will continue to be fluid, malleable, and flexible. The other day our 4 year-old told me he had “changed his mind”. Rather than the usual lime Popsicle, it was time to try the strawberry. Keep changing your mind and Your Mind, my love. He also told me he wants to go to Canada.